The Always typeface is a sophisticated script style font family that was created by South African typographer Aaron Scholtz. Always is beloved for its close resemblance to actual cursive handwriting, and is a top choice among brides when choosing wedding invitations and other wedding stationery. Making thorough use of exaggerated descending and ascending ligatures, the Always font family has an affluent, liberal appearance that is just the thing for adding a warm and personalized feel to everything from wedding invitations to greeting cards to book covers and more. As a media for women’s advertising, there is perhaps no better choice than the Always font family. The Always typeface made its debut in January 2010. Anton Scholtz of Scholtz Fonts in Durban, South Africa, is the designer of the Always font family. Scholtz designs fonts that are inspired by the culture of Durban, his birthplace. Always typeface has been used in packaging, book covers, greeting cards, advertising, scrapbooking, wedding media, and more. Scholtz has been designing fonts since 1991, and had an initial aim of enhancing the work that was being produced at the time by his graphic design company. In 1997, Scholtz began using computer assisted font design and later published his fonts online. With two decades of design experience under his belt, Scholtz is based in Africa, where he has been particularly influenced by the Zulu culture that tends to give an African feel to some of his work. Scholtz is not only a talented typographer and graphic designer, but is also heralded as an artist; he has created many paintings and artwork for public buildings and hotels throughout the African continent. There are an unlimited number of uses for the beautiful script characters that are found in the Always font family. The most obvious use for the Always font is for wedding invitations. 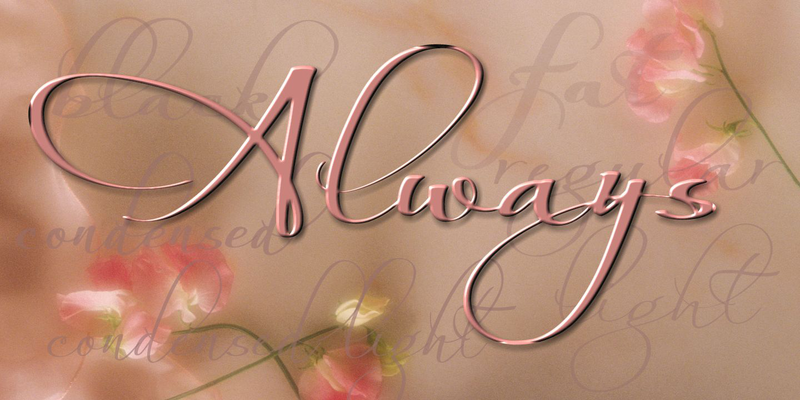 Always is popular for weddings because it is an elegant and stylish font. More casually styled fonts may be appropriate for less formal affairs, but for a formal wedding, the Always font is a top choice among discerning brides. And since the Always typeface has almost 300 characters, the font family has a full character set of both uppercase and lowercase letters, numbers, and punctuation. Additionally, the font features special characters that might be required in a myriad of applications, both in print and digital format. The Always font includes symbols, characters for ligatures, as well as alternate and accented characters.